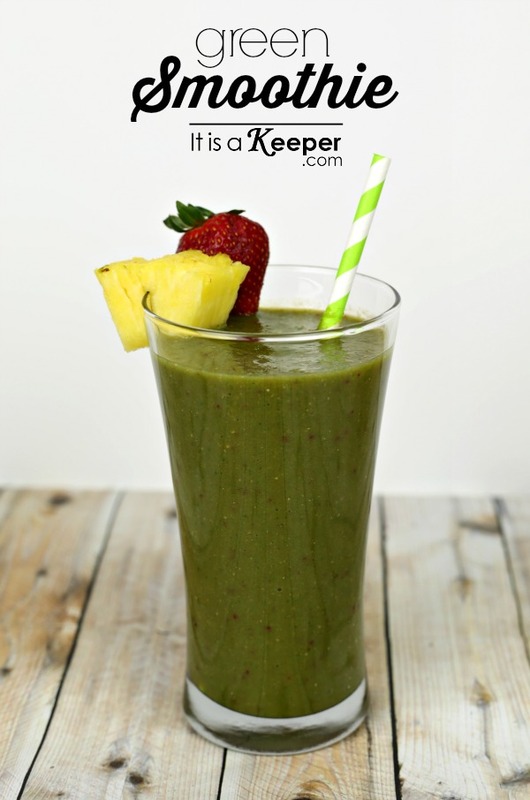 Who loves a good healthy breakfast recipe? 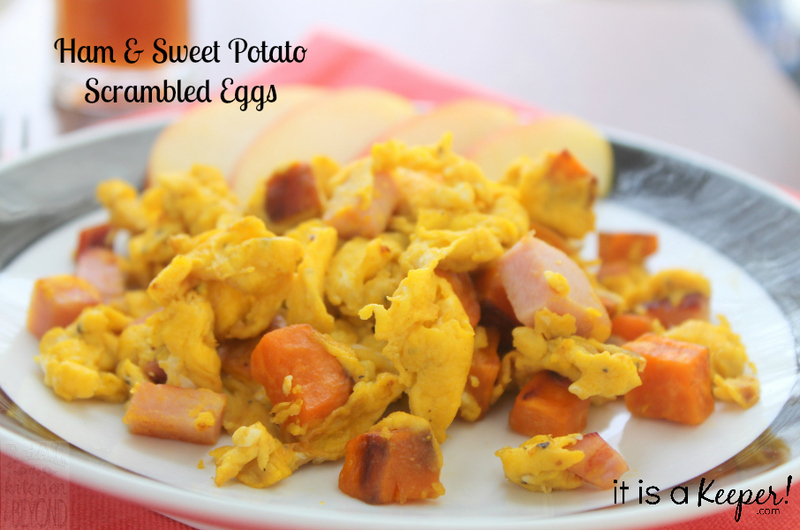 We are taking scrambled eggs to a new level with this ham and sweet potato scramble. Hello. 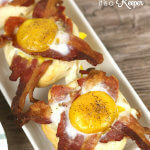 It’s Heather stopping by to share a yummy breakfast recipe with you this week. Weekend breakfast is A THING in our house. 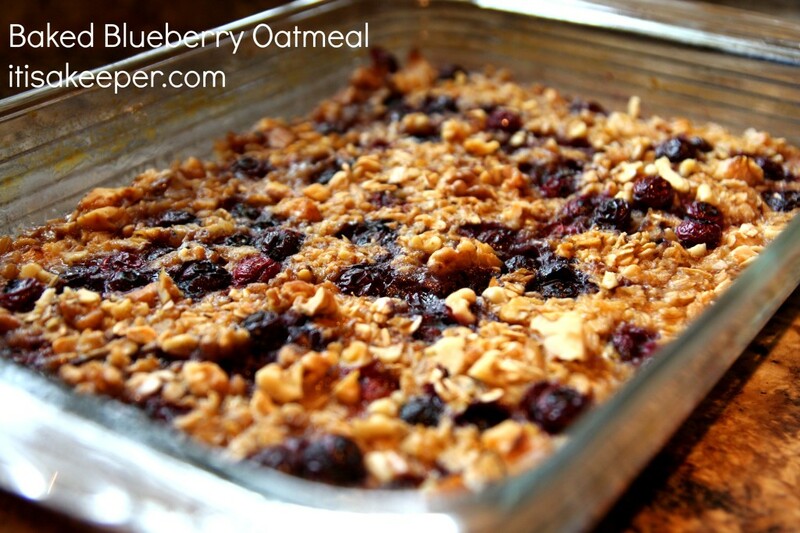 During the week we eat oatmeal and granola most days but breakfast has its time to shine on the weekends. 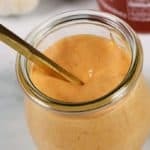 Most often we choose pancakes or waffles, but sometimes I want something different. Eggs are the common solution. However, while my oldest son could eat eggs every day, I am not such a fan. 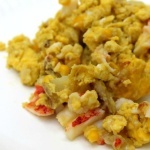 I like my eggs scrambled with everything but the kitchen sink, like these smoked sausage and hash brown breakfast wraps. 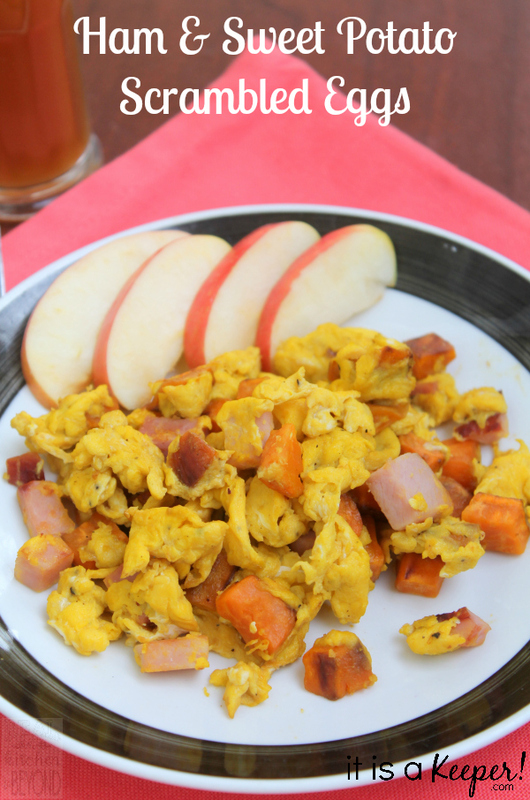 I wanted to add some more healthy breakfast recipes to our breakfast options so I started experimenting with eggs and fell in love with this ham and sweet potato scrambled egg. In my eyes it happened quite innocently. One moment I was thinking of my favorite diner meal – bacon, fried potatoes, and a side of rye toast, and the next moment my eyes landed on a beautiful orange sweet potato. I knew what the morning eggs would look like. In my family’s eyes it wasn’t quite so innocent. They struggle with that beautiful orange sweet potato and were sure I was plotting their misery. They’ve learned the guinea pig status of a recipe testing family isn’t always in their favor. They have also learned that they need to at least give it a try, and they were pleasantly surprised. I felt the sweet potatoes tasted just as sweet potatoey as usual but the man of the house said they “didn’t taste as sweet as sweet potatoes usually do”. The two boys agreed as the daughter wrinkled up her nose. 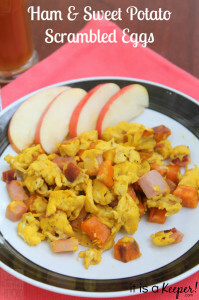 Overall, ham and sweet potato scrambled eggs were a success, although I believe I will be cutting the recipe down to make them for myself more often than the whole family. 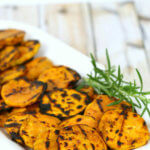 I love the sweet and salty combination of ham and sweet potatoes together. I know some of you might argue that ham isn’t the healthiest meat option but that’s why I use it in moderation. 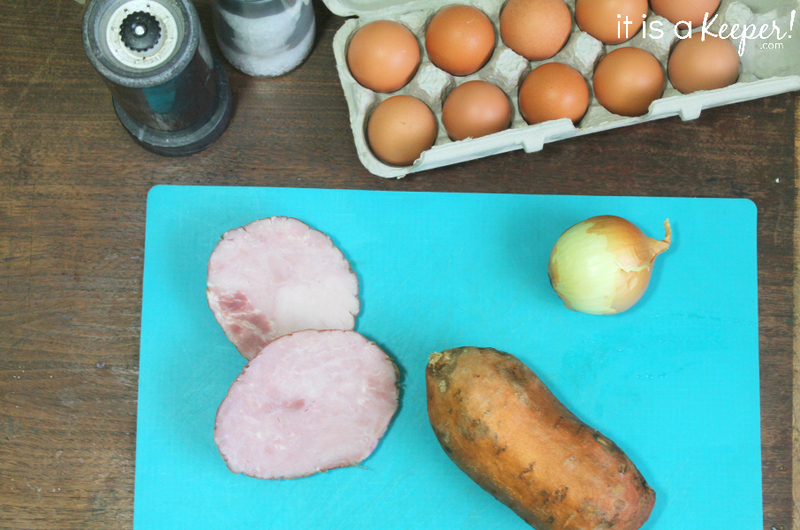 This recipe takes only 1 cup of diced ham so it really is a miniscule amount. 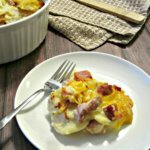 Once you taste these eggs you will know the ham is the perfect touch. Oh, and a quick secret? Beat those eggs – beat ’em good. Beat them until they have a nice foam on top for the best scrambled eggs in the world. What is your favorite healthy breakfast? Leave a comment and let me know. Heat oil in pan over medium temp. 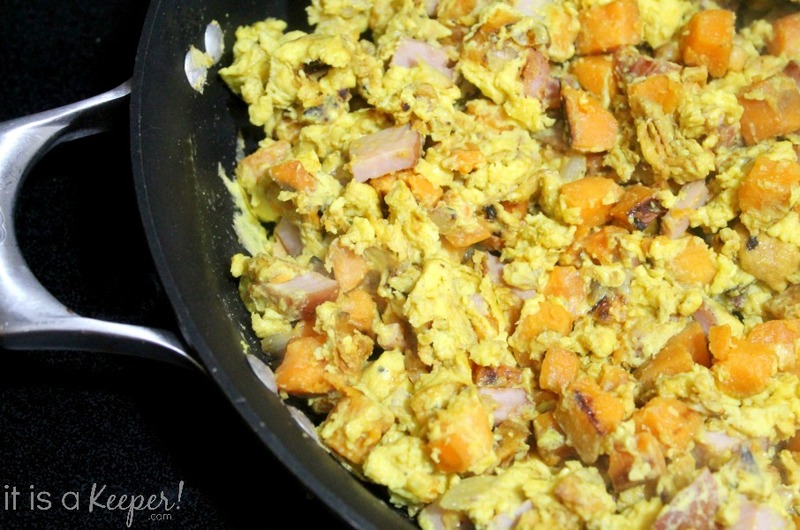 Add diced sweet potatoes and onion. 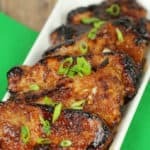 Heat for a few minutes while you beat eggs and pepper. 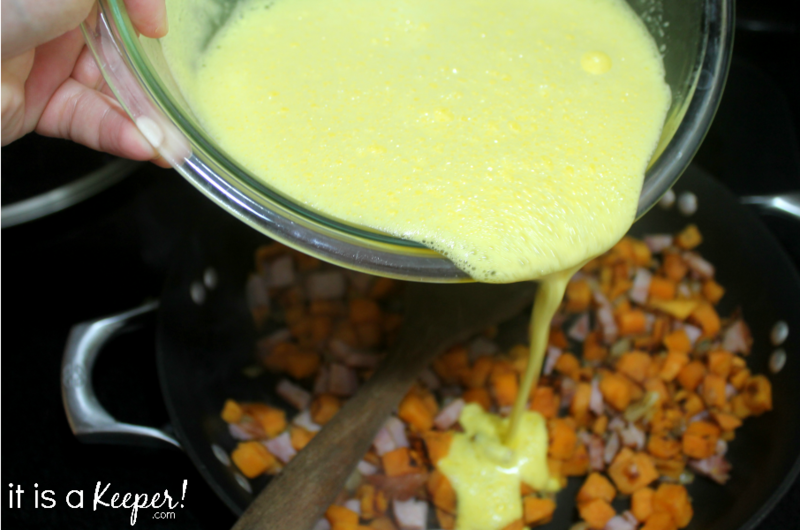 Pour eggs over sweet potatoes and ham. 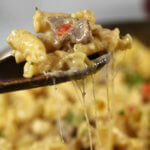 Stir constantly until cooked through.